Details play a role in showcasing who you are as a couple and the overall mood of your film. Each aspect of your day plays a huge part in creating the full sense of your film, from the bridal gifts to the send-off, every detail you choose to incorporate in your day tells the story of the two of you. However, there are some details you may not think of, such as how much natural light is in your bridal suite. Sometimes those things are out of your control as they are what your venue offers, but they do play a role in the overall tone and ambience of your film. We had a bride recently gift her bridesmaids with their own mirrors and a basket of pamperings. As they all sat around the table getting ready with matching mirrors and gift baskets, the room turned into their own. 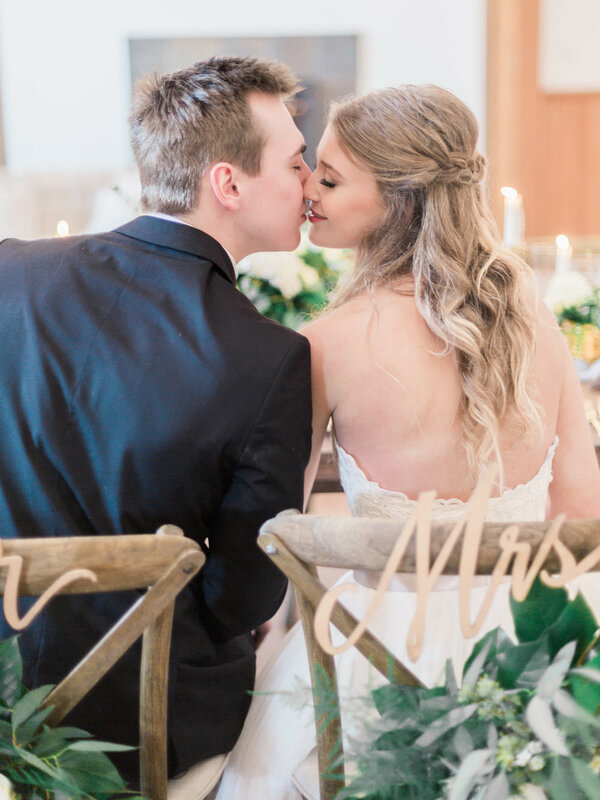 These small details add to the ambiance of your day as a whole and continue to allow everyone to see who you and your partner are as a couple in the biggest or simplest ways! When capturing your film, most videographers will take a hands-off approach in capturing the natural events of the day. But, when it comes to the intimate moments of your film, the moments after the first-look and the ceremony, these are some of the best times to capture the two of you. Traditionally, couples carve out time for the photographer at these times and the videographers follow along. We have found that adding ten minutes onto the end of this for the videographer to lead adds a huge impact to the footage for both the videographer and the photographer. So, our piece of advice for couples is to carve out even a few moments for your videographer to lead, and the results could be some laughs, raw moments and some pretty amazing shots for the photographer as well! Photographers capture everything from family photos to first-looks. Some are intimate, raw moments and others are posed photos with family members that you will cherish for a lifetime. Where video differs is most videographers will take in the moments from other angles rather than head on. When was the last time you watched a movie and the actor looked at you through the screen? It does not happen often and that is for a reason! So, the best piece of advice we could give you is to not be shy when smiling at the camera in the photographers hands. And, when it comes to your videographer, act as if they are not even there, and the result will be raw emotions and moments that you did not even remember that unknowingly made it into the magic it was! Another tip: Depending on your photographer, when they shoot, they like things to move a bit slower to make sure they capture the moment (kisses, walking and the likes) whereas when it is video, drawn out slow movements look very unnatural on film, so it is best to be as natural as possible when your videographer is leading! We cannot tell you how many times we get people telling us, “Oops, sorry, I’m in your shot.” But you are supposed to be! We see this a lot in the beginning of the day with groomsmen and bridesmaids. Yes, it is a little awkward at first, but chances are, if you are in the wedding party or a family member, the bride and groom want as many moments with your beautiful faces in them as possible! Our advice would be to brief your wedding party that videographers are coming to capture your day and that includes all of their smiling faces too! Shy? Just act natural! Of course, easy for us to say as we spend our time behind the camera! But, we promise you will want as many people in your film as possible! Wedding coordinator? Family friend? Regardless of what your budget is, having an appointed person that questions are filtered through and who stays on top of the timeline of events is so so important. Being in this industry, we have found that you should be able to find an event coordinator for the day-of at any budget, and you most certainly should. One moment that made this detail so important to us was when I had a maid of honor lean over to me and tell me the bride was about to give her mom a gift. That was huge to us! The bride could not have as the room was quiet, and she was with her mom. Having even a second of notice can make all the difference when it comes to capturing all the big moments of your day, and the reality is as either the bride or groom you have so many other things that are worth your attention, this is the last thing on your mind, and rightfully so! As your videographer, capturing moments is our biggest focus and letting your point person and/or coordinator know to keep us in the loop allows for every possible moment worth cherishing to be captured! Author Bio: Hello, I’m Hannah! I own KW Productions, a video production company located in Eugene, Oregon, with my husband Andrew, and I am in love with what I get to call work. This first year of business is a result of many years of praying and seeking what makes me come alive, and I would not trade it for the world. As we have embarked on this journey we have been blessed with so many amazing opportunities, meeting so many kind hearts and learning and growing through it all. It has truly been such a wonderful experience that leaves me excited for the journey ahead.